I've been away on vacation to the land of red earth and blue skies, where the food is hot and the people are easy-going - New Mexico. Incidentally, this means that I have been away from the kitchen and, to tell the truth, a bit loath to return to it. 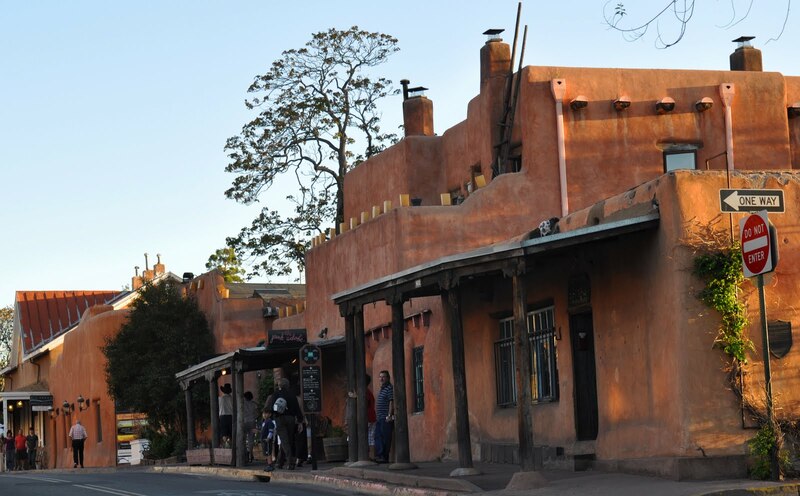 But, nostalgia for spicy New Mexican cuisine did take its toll after all... What came out is a pretty lazy and approximate implementation of a chili stew we tried in a restaurant on one of the main Santa Fe streets. The restaurant was in one of the numerous adobe-style houses which look so stunningly pink against the blue sky. Sitting with good friends in the inner courtyard, enjoying good wine, good food and great conversation was one of those moments that are the spice and flavor of life. First chop the pork into bite-sized pieces and fry in olive oil on high heat in a large pot, until the pieces have nicely browned. When almost browned, add minced garlic and chopped onion and fry together for a bit. Then add chopped tomato, pour enough water to cover the meat completely and lower the heat so that the meat is slowly stewing; add bay leaves, one branch of basil (I used a whole one and discarded it at the end), salt to taste. Allow 1-1.5 hours for the pork to cook through. Test a piece at about 40 minutes and estimate the remaining time. Add a can of drained beans at the same time. They are there to add thickness to the sauce, so don't try to make them keep their shape. The potatoes cook for about 20 minutes, and peppers take about 10-15. When about 20 minutes remain before the meat is done, add potatoes cut into 1" cubes. If not enough water, add some boiling water. When 10-15 minutes remain, add a very finely chopped zucchini, 1 jalapeño pepper, all sweet peppers cut into bite sized squares, the rest of chopped basil and black pepper. If not enough water to cover, add water. After a minute or two, test the spiciness and add serrano if not spicy enough. Wait till potatoes and peppers are almost done. Add boiling water until the stew is of a rather soupy consistency. If you want it thicker, you may not need the flour. In a cup, mix the flower with a small amount of water until free of clumps. This should be a liquid enough mixture to pour (like liquid yoghurt). Then, while quickly stirring the sauce in the pot, slowly pour the flour into the sauce. The quick stirring of hot sauce prevents it from clumping. You may want to add only part of the flour mixture at first and stir the contents of the pot to see if the sauce is thick enough. Only cook for a minute or two after the flour had been added. Then, remove from heat and enjoy! The result is a rather soupy stew, which nonetheless is wonderful in both warm and hot weather. It was very close to what we had in that adobe-style restaurant, and Gary loved it. If you added too much of hot peppers (like I did! ), there is a way to remedy the situation: add a large whole peeled potato to the stew. It will absorb some of the extra spiciness (and also salt). At the end, remove it from the stew and eat later as a part of another meal.